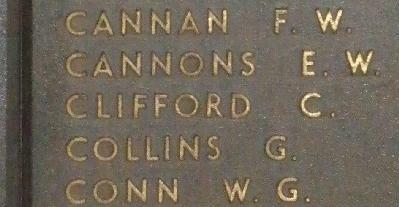 War Grave Register notes: CLIFFORD, Tpr. Convyers, 929. 7th Australian Light Horse. Killed in action 4th/6th Aug., 1916. Age 19. Son of Patrick Harnett Clifford and Mary Alice Clifford, of Huntingdon, Victoria Avenue, Woollahra, Sydney, New South Wales. B. 21. Place of burial Kantara War Memorial Cemetery (Row B, Grave No. 21), Egypt.